An article on the Smashing Magazine has an interesting perspective on what is responsive web design and how to actually get it right. Taking note on the performance is the right approach. How to Interpret Indian Head Shakes? Talk about cross-cultural communication, a lot of people have been confusing themselves about what does it mean when an Indian shakes his head. Someone actually put up a video explaining the different types of head shakes are and their meaning. I hope it helps in reducing miscommunication. What are the differences between Visual Studio Community Edition (FREE) and the Express Editions? If you are a developer working on Microsoft (or perhaps Linux since Microsoft is open-sourcing its .NET Core) platform, it is likely that you would have heard Microsoft releasing a rich featured edition of Visual Studio at absolutely ZERO cost. The new edition of the FREE Visual Studio is the Community Edition. Visual Studio Express Editions do not allow users to use extensions (aka. plugins). Visual Studio Express Editions are targeting specific platforms e.g. Web, Windows and Windows Desktop apps. Download Microsoft Visual Studio now! What is History and the Benefits of History? Very often when we think of History, we will associate it with boring. But why schools are still offering History as a subject? What exactly is History and what are the benefits of knowing the past? The following short video perfectly address this. Once upon a time there were four people named Everybody, Somebody, Nobody and Anybody. When there was an important job to be done, Everybody was sure Somebody would do it. When Nobody did it, Everybody got angry because it was Somebody's job. Everybody thought Anybody could do it, but Somebody realized that Nobody would do it. So it ended up that Everybody blamed Somebody that Nobody did what Anybody could have done in the first place. In light of multiple cases whereby payments were attempted with coins amounting in thousands, the Monetary Authority of Singapore (MAS) has released a statement on the legal tender limit for coins of denomination. Below 50-cents is S$2 per denomination. For 50-cent coins, the limit is S$10. There are no limits for S$1 coins. A payee has no obligation to accept coins beyond the legal tender limits set out in the Currency Act. 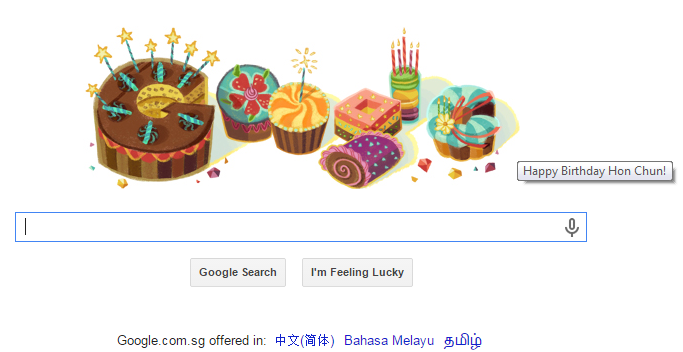 Birthday doodle from Google for this year is exactly the same for the past 2 years (2013, 2012). Birthday doodle for 2010 was different. How do I uninstall Chrome's new Bookmark Manager? Google has been working on a new bookmark manager for Chrome. This upcoming bookmark manager is now on the Chrome Web Store as an extension before it is integrated into Chrome by default. This new bookmark manager extension looks beautiful but it does have its own shortfall for now e.g. inability to sort bookmarks by title. Type chrome://flags on the address bar. Search for Enable Enhanced Bookmarks option. Type chrome://extensions on the address bar. You should see the bookmark manager extension now. Remove the bookmark manager extension. When a user attempts to follow a broken link or mistypes a url on a website, the user will often be redirected to a typical friendly "404 Not Found" web page so he knows what has happened, instead of throwing some ugly error message. One way to enhance the experience would be to guess where the visitor intended to go and suggest that page or shows a list of possible pages. An article by the Smashing Magazine describes an approach that makes use of Google's Custom Search API for this purpose. Before embarking onto the implementing it on production, please do note that the free tier for this API has a limit of 100 calls per day.